A particle is under acceleration when it's speed changed over time. When a particle is moving around a circle with constant speed. You can click Play to start the simulation and click pause to stop it. More information will be displayed when the simulation is paused. When the simulation is paused at time t: The RED arrow shows the velocity vector at that time. Another vector in Magenta shows its velocity at previous time step t-dt. We also draw those two vectors again from the same starting point (which is the center of the circle). You can find out the difference between two vectors (GREEN vector). Click STEP button to make the time step forward and watch the differences. I hope this applet can help you understand why acceleration is required for constant speed circular motion. Here is another applet about circular motion. 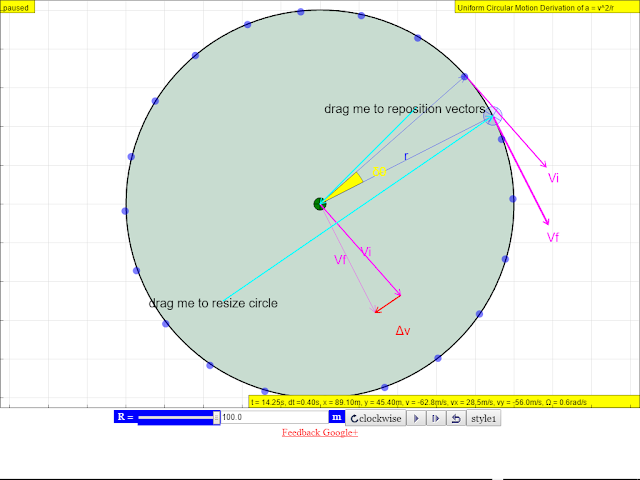 It was designed to illustrate relation/constraint for circular motion: a=V2/R. The blue arrow is which is always pointing toward the center. Subject: RE: RE: Was Constant Speed - I/O 390 engine performance ?